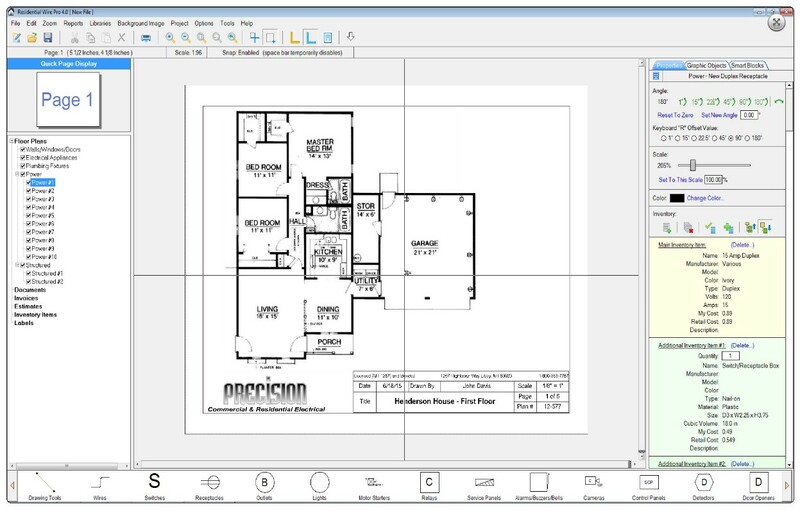 The Residential Wire Pro 4.0 Software allows electricians, contractors and technicians to draw detailed electrical floorplans with power, low voltage and structured wiring symbols. In addition other information can be generated such as labels, simple invoice and estimate sheets. Why should I use the RWP? Homes and their electrical systems are becoming more sophisticated, accurate detailed information is a benefit for you and the homeowner. You can leave your contact information on every floorplan for possible future call backs. The days of an electrician wiring a home and providing no documentation are coming to an end. Homeowners, inspectors, lending institutions and others will be requiring detailed documentation. Easier to use than most CAD programs and geared toward residential electrical needs. 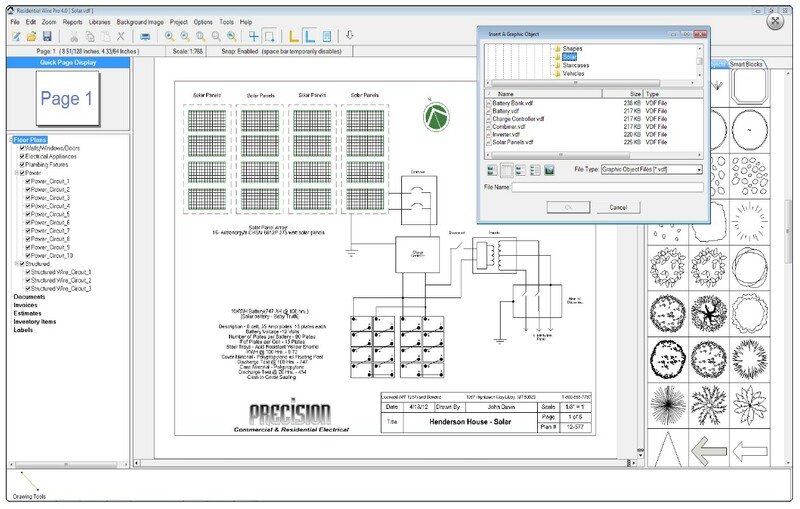 Step above your competition by providing your customers with professional looking diagrams and other detailed information. Add value to every job. We are setting a new standard for residential wiring information and documentation with this software. No more vague breaker panel labeling or wondering how many receptacles are on a circuit. Electrical contractors, now you can leave a professional print with each residential job with valuable electrical information for the end user and your contact information. This will add value to every job you do and add more repeat business. 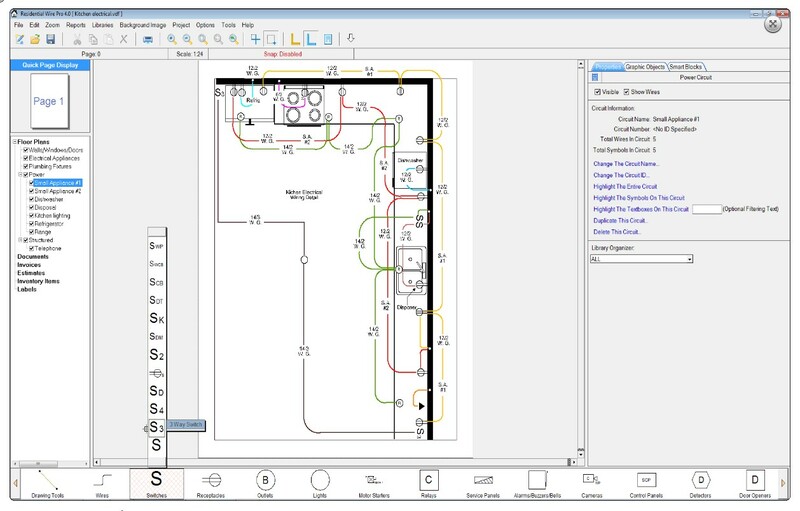 The built-in symbol library allows you to draw electrical floor plans without the steep learning curve usually associated with CAD software. Buy it and be using it the same day on your residential wiring jobs. Building contractors, electrical inspectors and homeowners will soon be insisting on the type of information this program will allow you to provide. Draw walls quickly with our new wall tool. Add as much detail as you need from just showing switches and lights to showing all the electrical circuits with the wiring. See our screen-shots for examples, you can also view our RWP videos to quickly learn to use the program. 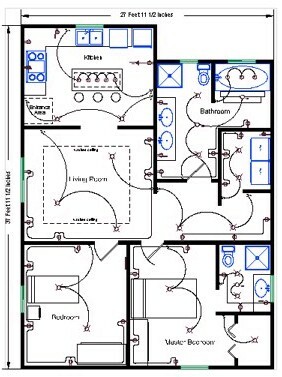 The Residential Wire Pro allows you to design detailed floor plans while giving you a powerful yet easy way to manage and keep track of multiple circuit layouts for all aspects of modern residential wiring. 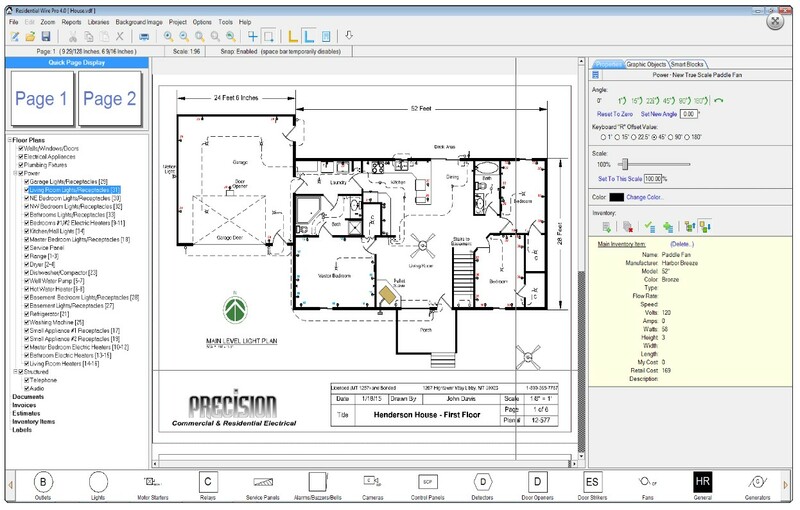 Built into the Residential Wire Pro is an extensive symbol library which provides quick access to pre-designed objects that make your designing experience fast and easy. 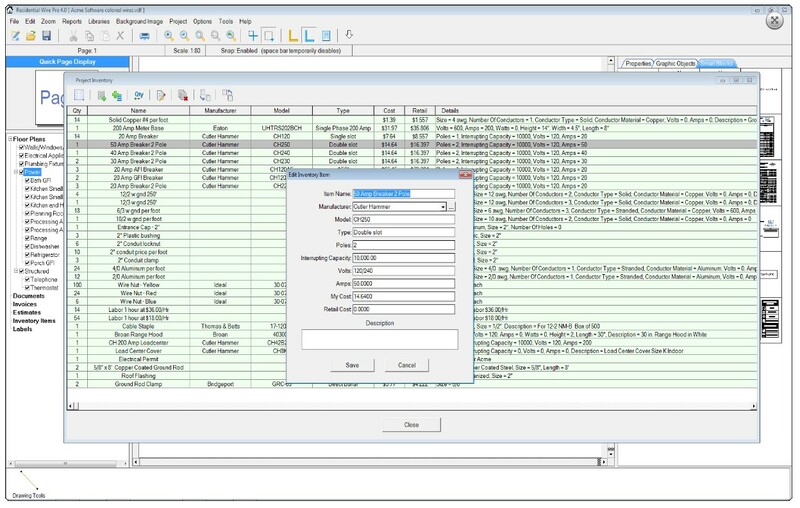 Affordable and easy to use inventory database and report generator. We include some common items in the inventory that a residential electrical contractor would use and you can add your own items and your prices. Simple or itemized reports can be generated for bids, invoices or items used lists. Main drawing screen with a sample floor plan. Also shows inventory item assigned to a paddle fan symbol. 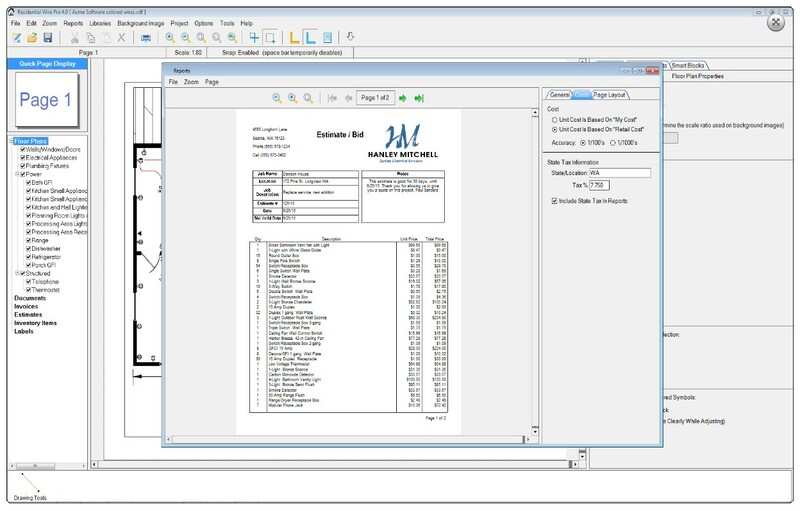 Shows a sample report that can be generated and the various options available. Sample diagram with a symbol legend and information legend. 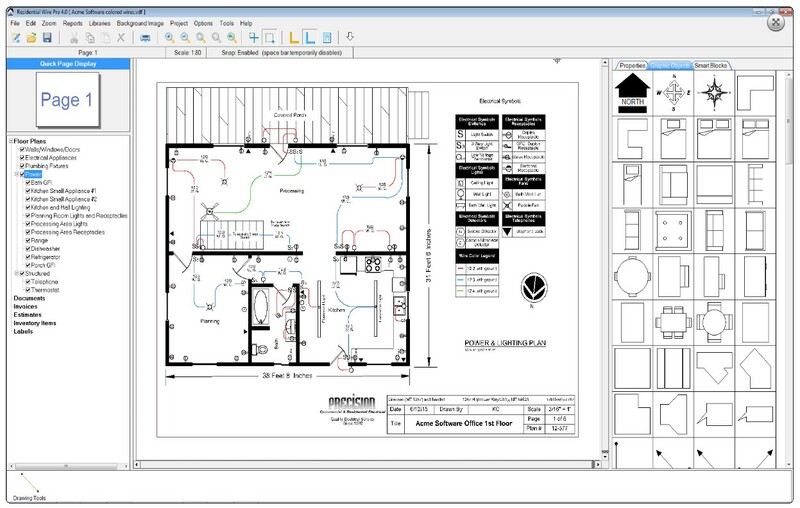 Image showing an imported PDF Floor Plan and adding symbols to it. Image from the Inventory Manager. Add items and prices to your inventory database. 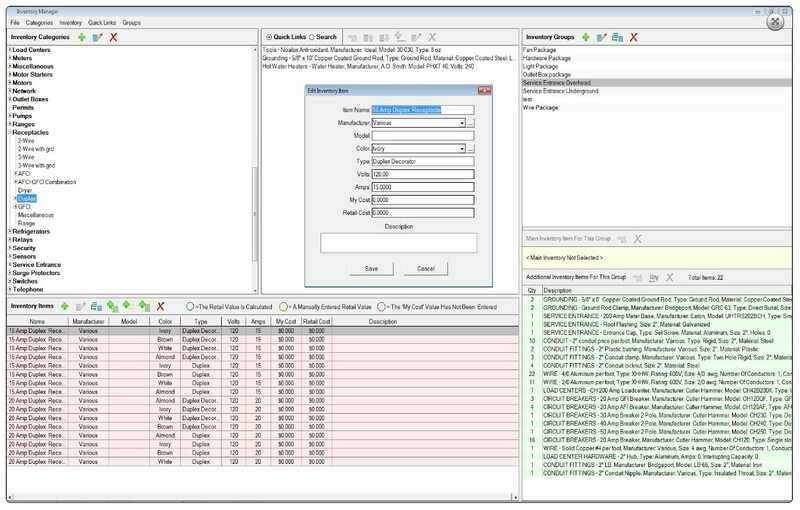 Shows additional inventory assigned to a project. Inventory can be assigned to a symbol in the floor plan or here. 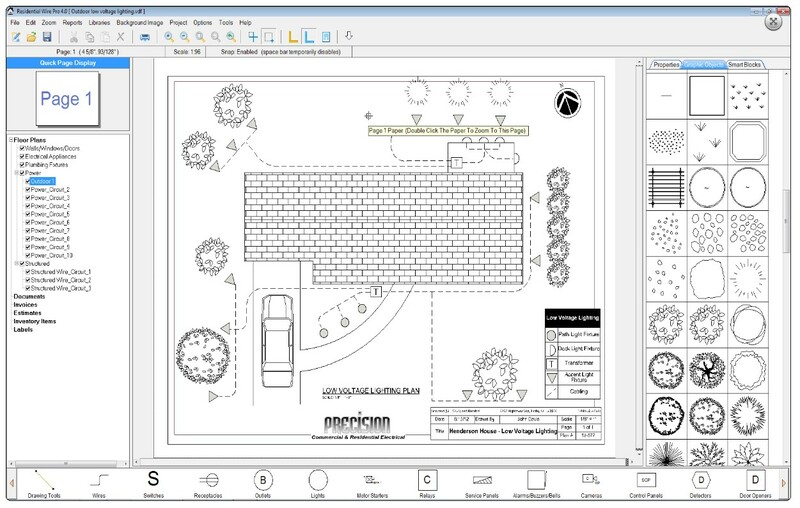 Outdoor lighting diagram with various graphic objects. Simple solar diagram. Mainly drawn with graphic objects.